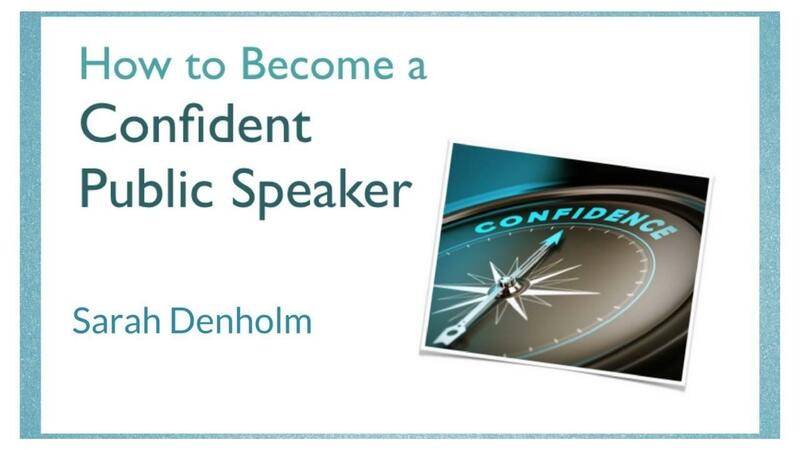 How to Become a Confident Speaker - Presenter. 'How to Become a Confident Public Speaker' gives you solid, simple, proven systems to deal with your fear and anxiety, and become a confident, engaging and clear presenter. Positively change how you feel about public speaking! This in-depth course will give you different, proven tools to manage your speaking fears, as well as the basics of good presenting. You'll make a difference to your life - not just your public speaking, but your whole life: there’s nothing like gaining speaking confidence to also improve your entire world. And this course will make a real difference for you; you’ll gain specific knowledge - and not just information but also insight into how to build your own success and freedom around speaking. I’ve deliberately gone deeper into tools and techniques than perhaps you’re used to, so that you can really have success with removing blocks - not just put a bandage on them. Now I don’t know if this is the first time you've taken action….or maybe you’ve tried to work on your confidence before and become disheartened. Whatever your challenges are, this course is designed to help you overcome your speaking anxiety and build confidence from various different angles: behavioural - using your behaviours and body to change your mind; and cognitive - using your mind and brain’s preferences to change your body. I’m going to look at the most common blocks my clients have to deal with, and show you how to overcome them. As you work through the modules, you will find ideas and techniques to help your particular situation and personality. I’m going to be your guide, to help you set the right game plan and take the right actions. You’ll have less stress, less wasted time and energy – and greater work and life satisfaction - plus more peace of mind. This course uses slides and my voice, taking you through every concept and technique. You also get downloadable templates and worksheets. These tools and techniques include the latest research from the fields of neuroscience, mindfulness, resilience, and presentation and communication skills. This course is perfect for you if you need to speak at work in the corporate world, not-for-profit or education. Or you may be an entrepreneur or have your own business – you may need to speak up in meetings, present more formally or conduct interviews – and are either reluctant, or simply not as engaging and confident as you would like to be. The content will also help you if need to speak at a social event like a wedding; or you might have a cause you truly believe in, but are unable to find your voice sufficiently to spread the word. You'll learn the best of what I've worked on over many years: both in my own life, and working with over a thousand clients from all areas of life in my business. 1. Roadblocks - or what might stop you from completing (or even starting!) the course. What you need to be aware of around motivation and change: which of the big 5 roadblocks might you struggle with? 4. Structure - How making sure you have a clear logical flowing presentation will build confidence for you, and also for your audience. How to organise your thinking with different structures according to your own situation - with templates so you can permanently create your own talks quickly and easily. 5. Practice - How to prepare in the best, more stream-lined and time-efficent ways for mastery with any presentation (I know you're busy!) without the mistakes that I see so many clients making - and how to make this a cornerstone to your success as a speaker. 6. Attitude - Mindset is so crucial - our mindset and beliefs run our lives: how to get - and keep - yourself in the right frame of mind when you need it most; how to deal with your negative inner voices - I will teach you what you need to do in order to think differently, and give you specific tools to work with. 7. Control - You may never have thought about this before but our brains have a strong need for control and certainty: I'll explain how this works; you'll learn what you can and can't control around your speaking. How to take control back: control of your goals, your mindset, your audience's expectations of you. 8. Energy - Where yours comes from, and how to harness and work with it so that you can deliver presentations with the right amount for both you and your audience. What to do if you're a low-key introverted constricted presenter… or the opposite - hyper and bouncing off the walls with stress. My story I really struggled with being in front of an audience: firstly in my original career as a Classical pianist, and then when I started to speak in public. I was truly awful: self-conscious, shaky, incoherent…and I suffered from mind-blanks. So I decided to learn what works – initially to overcome my anxiety, and ultimately to find out how to speak with authority and presence. And I’m not special: I just learned the tools and practised them. You can do this too. Course Uniqueness All of this took me years to learn; you don't have to: get the condensed version, the shortcuts in this course and implement this valuable information. Learn in your own time, and go over the content as often as you like - spaced repetition - which is how our brains learn best. You won’t find this in-depth, holistic content all in one place anywhere else - it's a combination of all the best I've learned over 30 years being on stage in front of audiences! I’m beside you all the way because I’m totally committed to your success. Requirements There is about 6.5 hours of video content. I recommend taking about an hour a week to go through each module, take notes, and do the downloadable exercises which come with most of the modules. 100% Risk Free Guarantee Plus there’s my 100% money back guarantee. If the course isn’t for you, ask for your money back after 30 days. Email me directly ([email protected]), and I'll refund your full payment. I care a lot more about keeping your trust than your money. You can become a more confident, clear, connected and engaging speaker! I look forward to sharing your speaking journey with you. Learn how to really build your confidence as a presenter, and overcome public speaking fear and anxiety. A comprehensive course full of practical, no-fluff tools and techniques. 6.5 hours of detailed video content, plus downloadable audio, templates and worksheets to simplify and maximise your progress. I'll be happy to help you out.